There are two things that come to mind when you think about Memorial Day weekend...spending time with family and friends and heading to the lake! Branson is a great spot to do both! 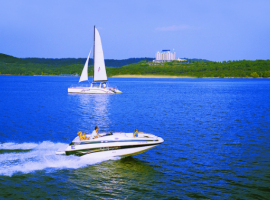 Branson offers two gorgeous lakes to choose from! Table Rock Lake spreads across Southwest Missouri and Northwest Arkansas. The lake offers some of the world’s best bass fishing, commercial marinas, and has over 850 miles of shoreline. Be sure to check out Table Rock Dam. It is over 6500 feet long and is over 250 feet above the stream beneath. When the gates open and the water pours down, it is an astonishing sight to behold! Lake Taneycomo is a cold-water lake that is great for trout fishing. It is stocked with close to 400,000 trout each year. The lake is also perfect for kayaking and boating. Lake Taneycomo flows right next to the Branson Landing. Guests will love the views of the water as they shop and explore! Whether it’s fishing, boating, swimming, or just sitting in a hammock by the lake, you’re guaranteed to have a great time spending time with the ones you love! All New for 2018: Hughes Music Show Ride a Segway!